2. Picture can be Horizontal, Vertical, Mirror and Normal adjusted. 3. 8 languages optional: English, Dutch, French, Portuguese, Spanish, Russian, German, Italian. 4. Automatic back lighting for buttons. 5. Multiple video formats: AUTO/ PAL/NTSC. 7. Operates from 10 -32V. Supports 12V or 24V automobile battery. 9. The scale can be adjusted for left, right, up and down. 10. Automatically switches to back-up,left,right camera views. 11. Built-in SMART IR-CUT filter makes image more realistic and avoid color blur. 12. 4 IR LED provide 32ft of night vision. 13. 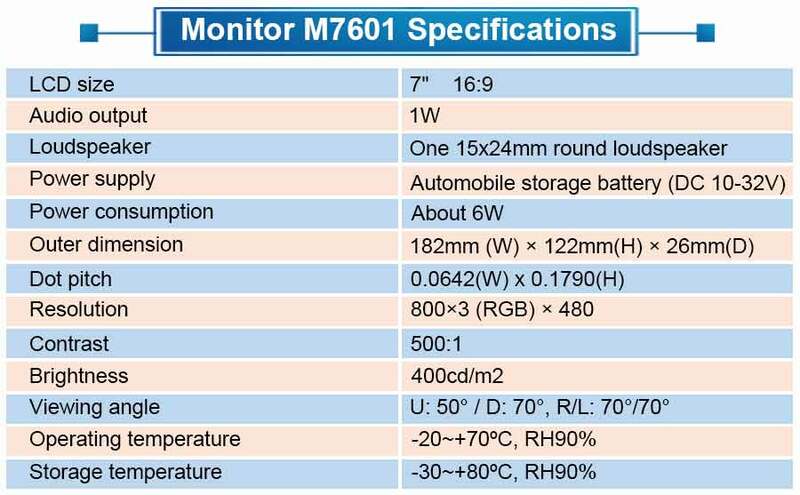 The camera is IP69K waterproof rating (highest IP rating) and the vibration rating is 10G. 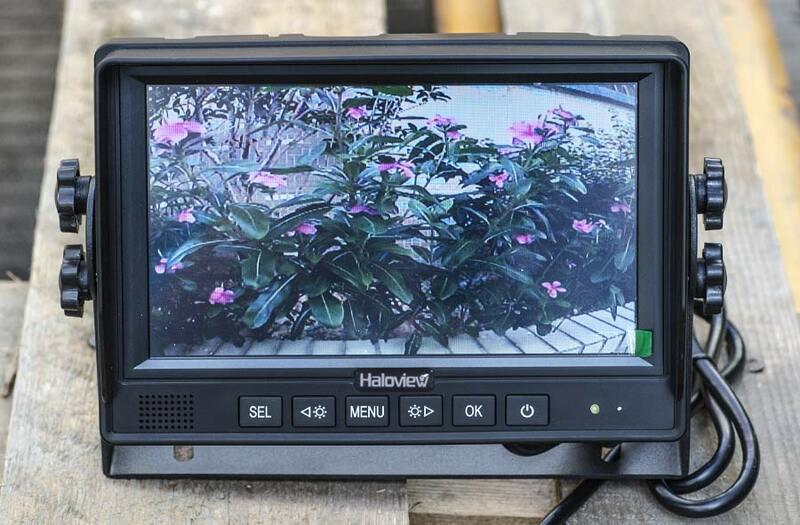 Haloview MC7601 Rear View System will take a little more time to install than the wireless kit. 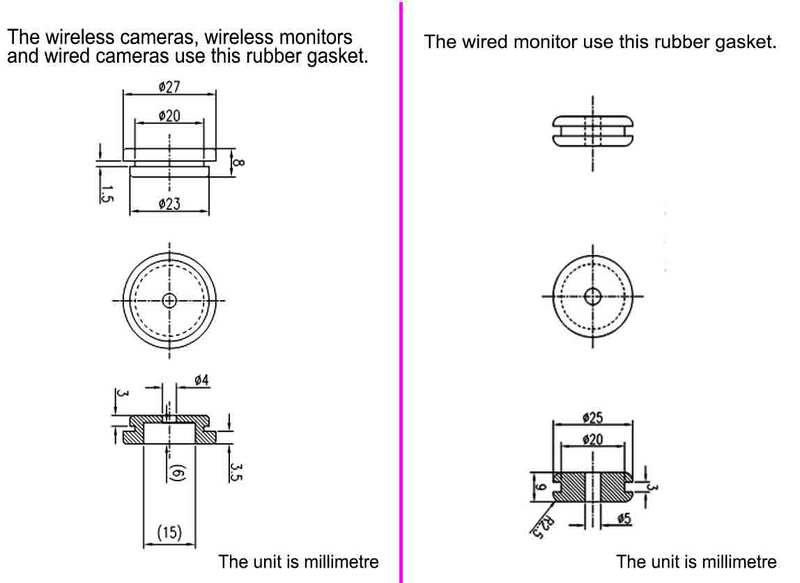 It could provide a slightly better image quality than the wireless system. 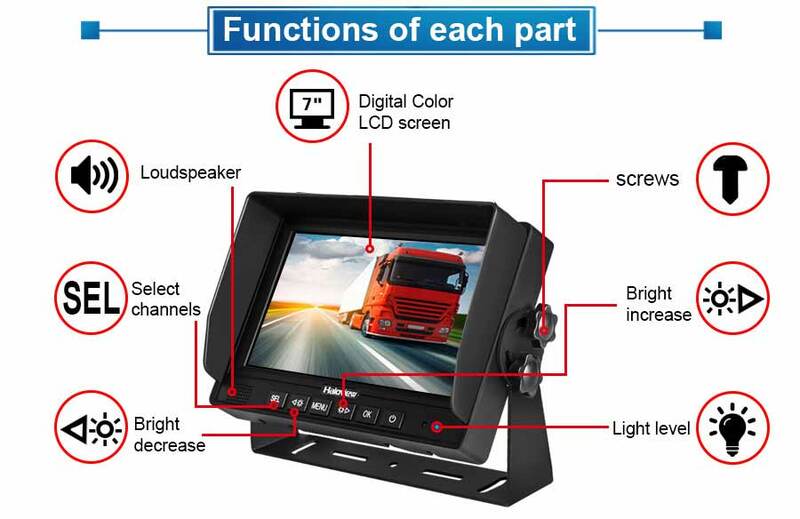 It has a 16:9 LCD display, a pixel resolution of 800 x 3 (RGB) x 480 with a 400 cd/m² luminance and 3 wired camera input. 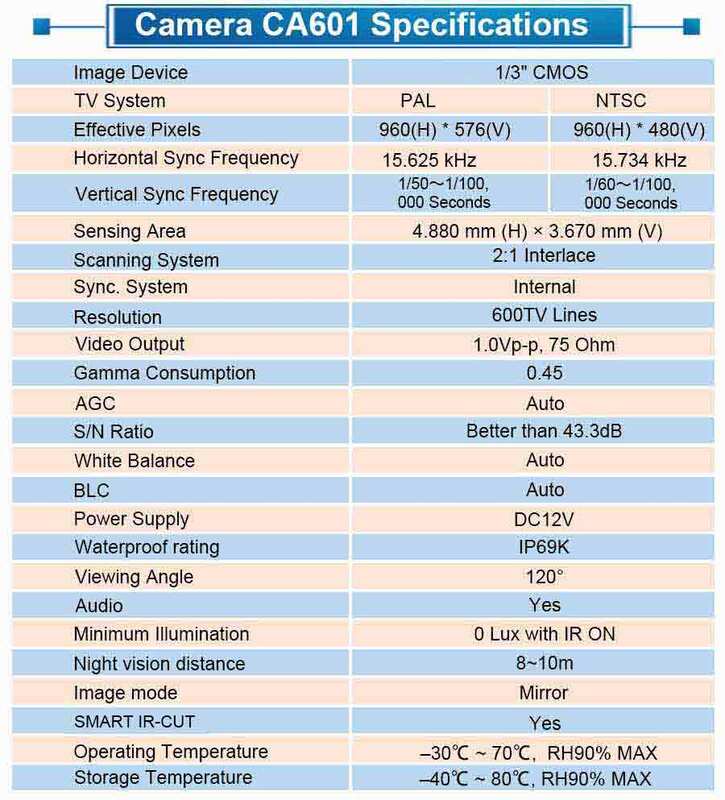 NTSC / PAL video system options are available. Auto dim function makes the monitor automatically adjusts the backlight to fit the ambient light. 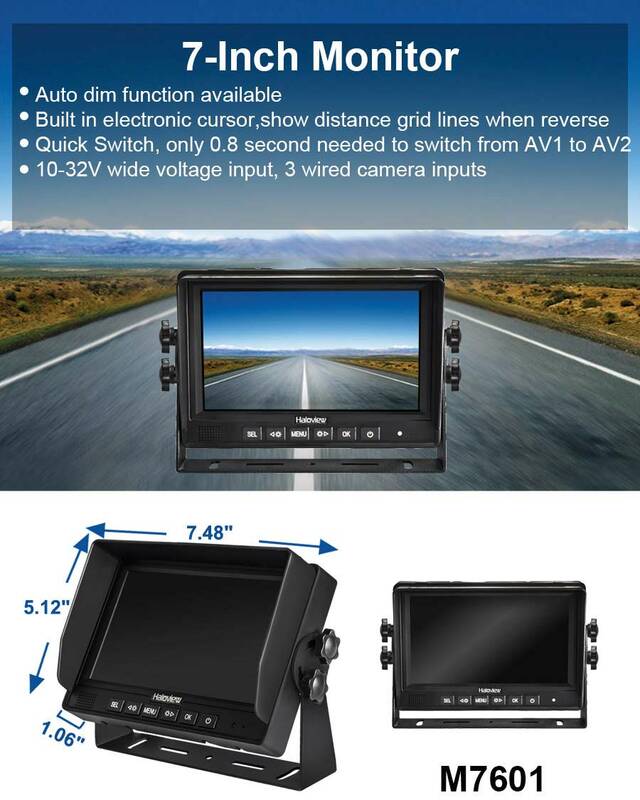 The monitor can be switched from CAM1 to CAM2 in just 0.8 seconds, this enable the driver to switch his views quickly in an emergency situation, and the parking lines can help the driver to judge speed and distance accurately. It also has a built-in microphone and audio speakers. 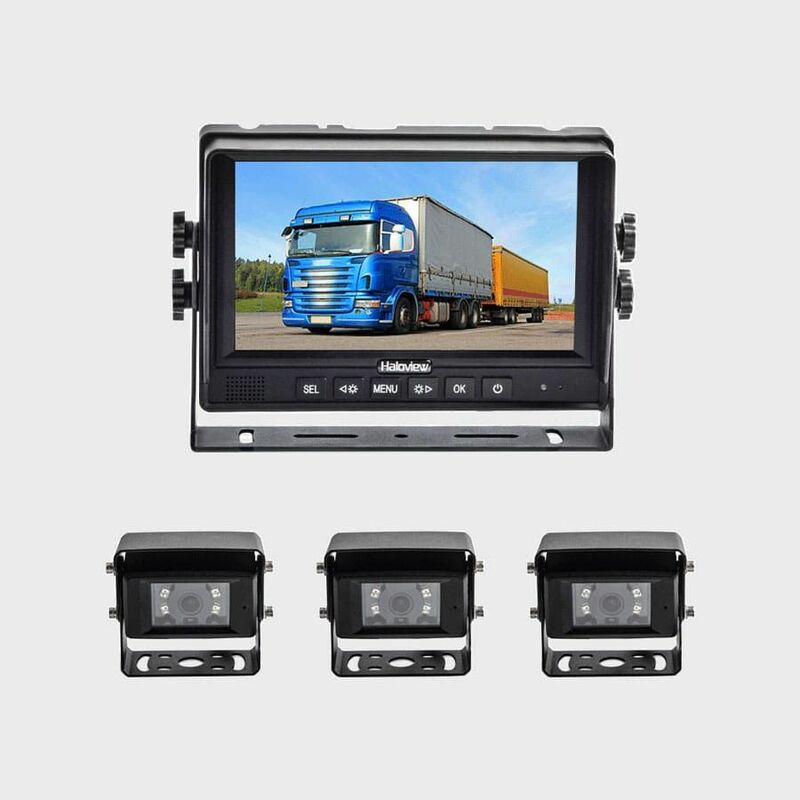 It produces 120°wide viewing angle, with a great sensor which provides effective pixels of 960 x 576 pixels ( PAL) and 960 x 480 pixels ( NTSC ) . 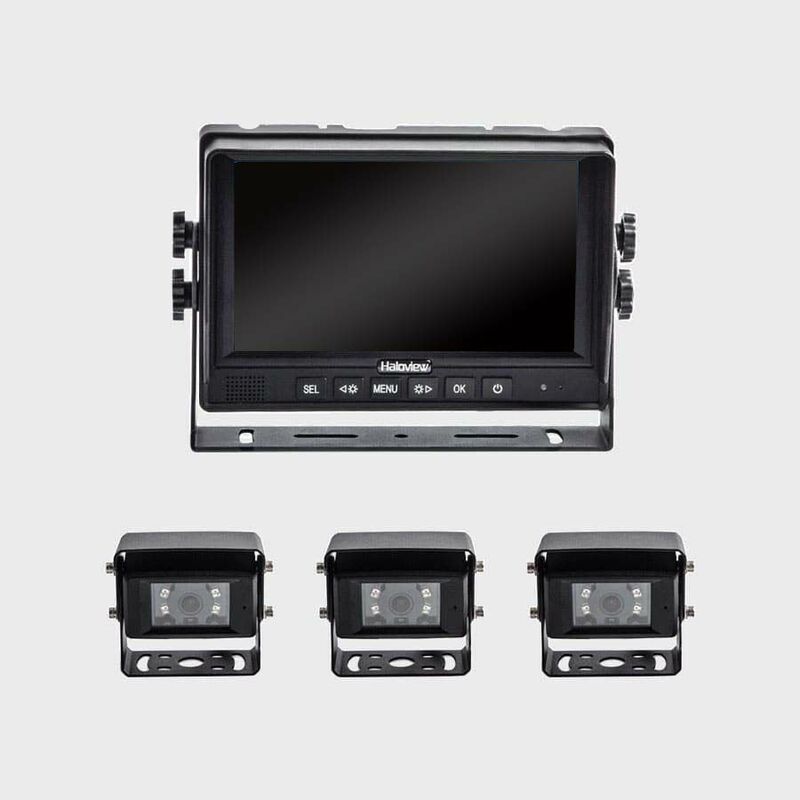 The built-in SMART IR-CUT filters present more realistic color images during the day. The infrared sensor will automatically turn on in low light condition and the image is black and white in low noise. 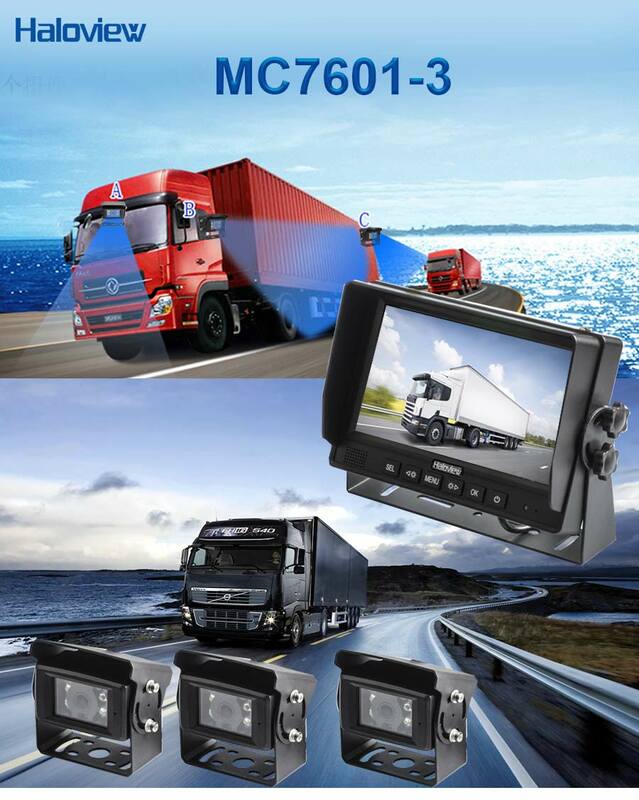 The camera is equipped with a heavy-duty metal sun visor that protects the camera from glaring and flaring. The camera has a 10G vibration rating that make the camera reliable and resistant. 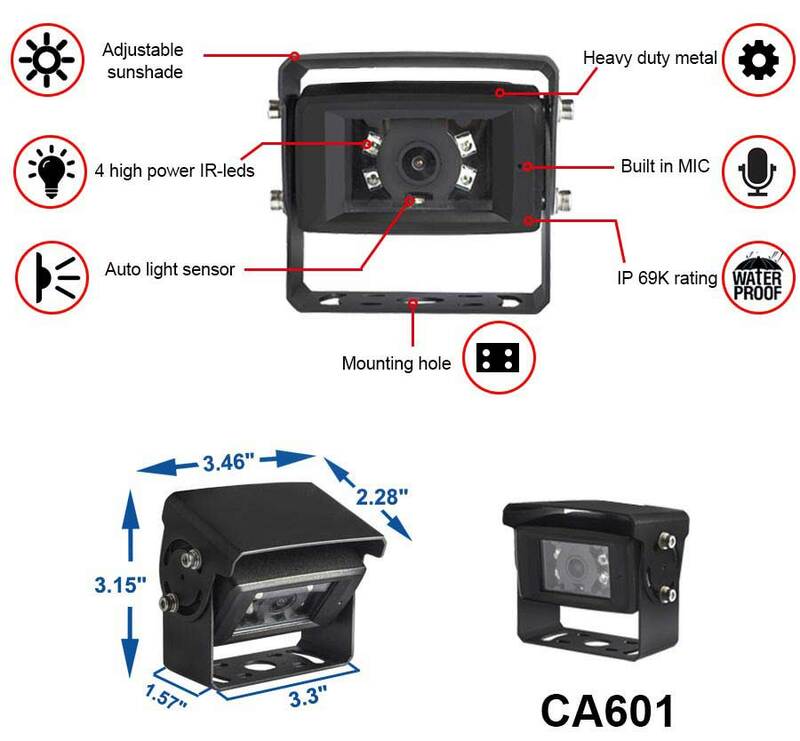 Its IP69K rating is completely make it to work well in wet conditions. Use 650nm filter at daytime, it will automatically switch to 850nm at night. It can avoid color blur. 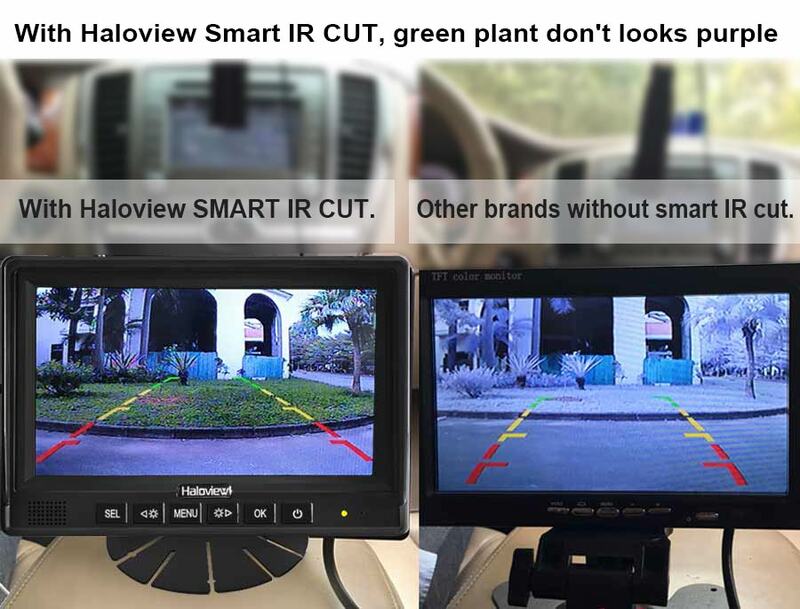 Haloview's rear view system use anti-glare screen,please tear off the monitor's screen protection film which may cause reflection after installation. 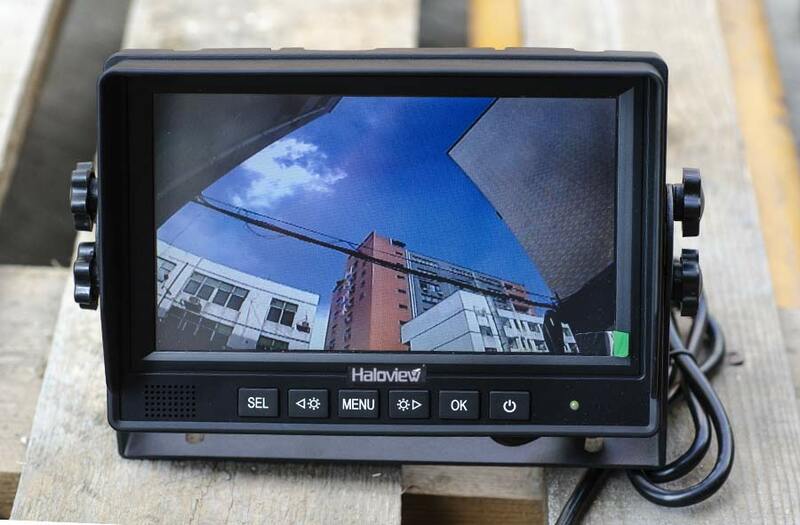 Q: How long does it take to install a Haloivew reav view camera system? 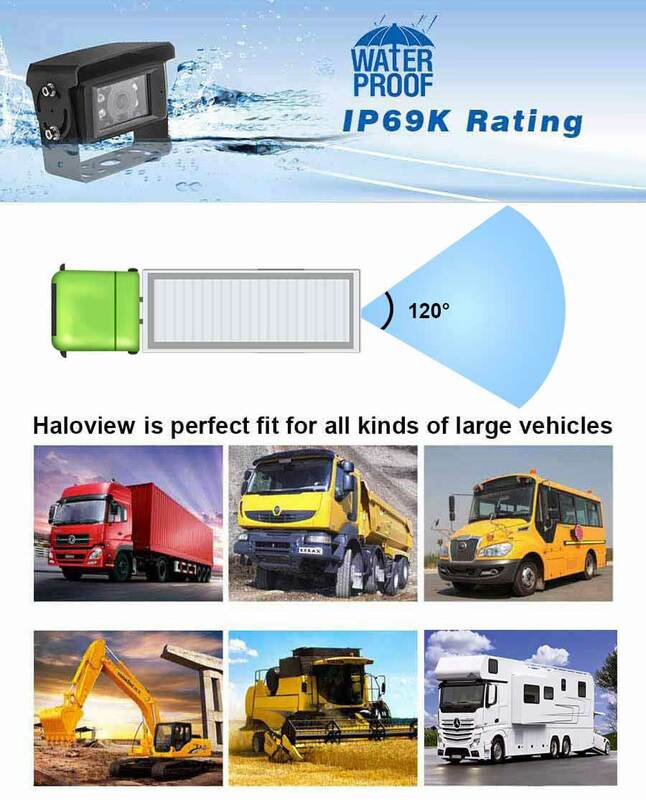 Q: What vehicles can Haloview wired systems be applied for? 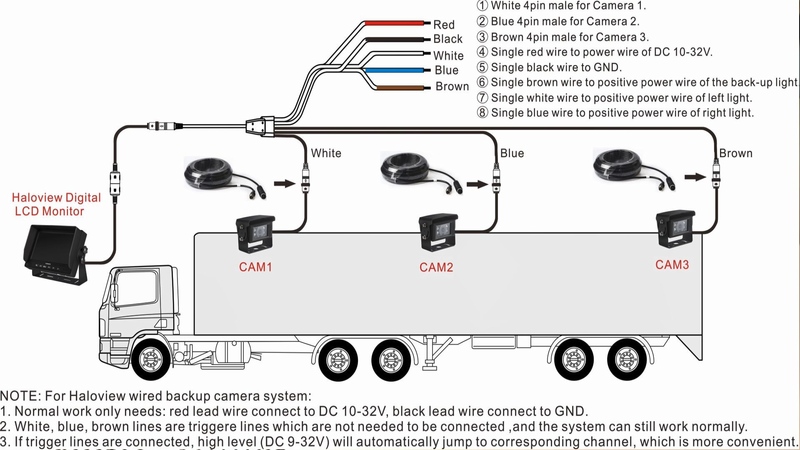 A: Haloview wired backup cameras could be applied for heavy-duty vehicles. It could be used for harvester, navvy, farm, forklift, crane and planter etc. 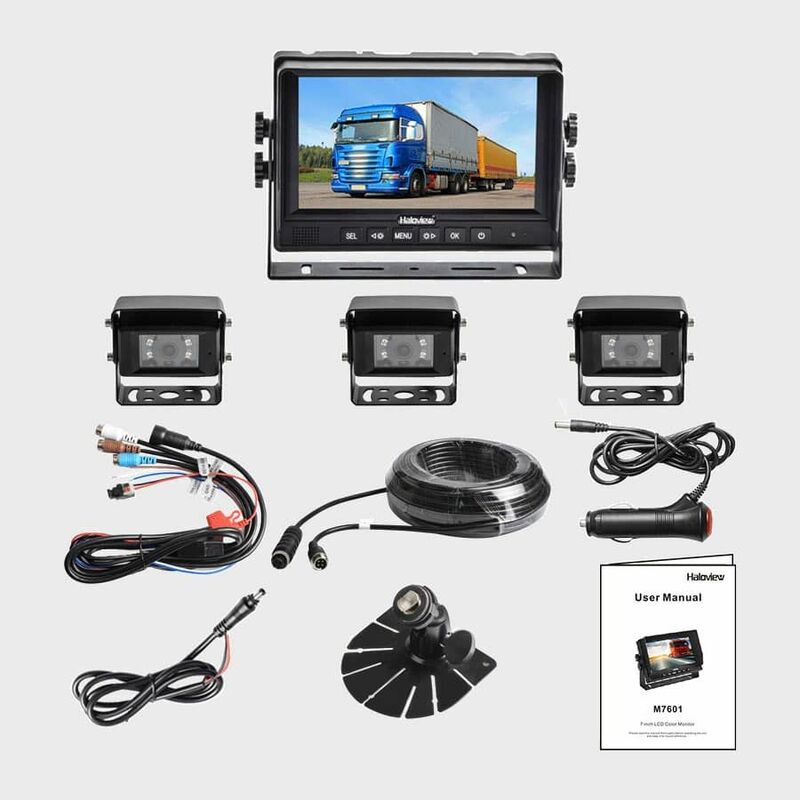 For those vehicles like fifth wheels, travel trailers or semi-trucks, you can also choose the wireless back up camera which is more easier to install.